Anyone who loves books knows that everything about them is interesting: The physical process of making them, communicating and distributing them, their price, the circles of people gathering around them, their reception, the ups and downs of their standing, their replacement and elimination, but also the mystery of their survival. This is how the author Elias Canetti put it. And thus Canetti validly expressed what this place is still about. Literaturhaus Frankfurt loves good books. Here, in the reconstructed Old City Library, everything revolves around introducing authors, books and ideas to the audience, in the best atmosphere possible and in an entertaining and inspiring way. Books by well-known and lesser-known great authors. For that reason, our program as well as our house offer various forms, formats, series, focal points and interest groups. There are readings, discussions, conferences, parties and performances. And the "Junges Literaturhaus" offers an extensive program for children and young people. The "KOLLEG SCHÖNE AUSSICHT – Das Literaturhaus für Lehrer" is the only institution of its kind throughout Germany for teachers of all school types, classes and subjects. Among the guests of Literaturhaus there are numerous authors from German-speaking countries as well as from all other parts of the world. This includes renowned personalities such as Umberto Eco, Les Murray, Jonathan Franzen, Martin Walser, Imre Kertész, Adam Zagajewski, Elfriede Jelinek, Alexander Kluge, Mario Vargas Llosa, Margriet de Moor, Cees Nooteboom, Tom Tykwer, Franz Josef Czernin, Bodo Kirchhoff or Herta Müller. If you are reading in silence, you are following an author. If you visit the Literaturhaus, you will also meet him. 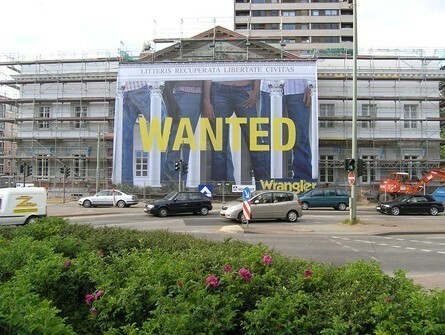 – that had been a very promising project for a group of Frankfurt citizens since 1989. They were working together to find a suitable site and to attract funding for the institution. In 1991, they found a place that offered a distinguished atmosphere: the Villa Hoffmann in the Westend of Frankfurt. For almost 15 years, the villa in the Bockenheimer Landstrasse 102 was home to the Literaturhaus. In October of 2005, the Literaturhaus moved into Frankfurt's recently reconstructed Old City Library. This location was even better – and bigger: on the waterfront of the Main, in the middle of downtown, Sachsenhausen, Bornheim and Ostend, which changes daily due to the construction of the new European Central Bank. The Literaturhaus in the reconstructed Old City Library is one of the most gorgeous buildings for the lively communication of literature in Europe. ... dates back even further, to the year 1789. Back then, people started to think about building a city library for the stock of books scattered all over the city. And in 1825, the first classicistic building was handed over to the public. It had been designed by Stadtbaumeister Johann F. Christian Hess and housed more than 50,000 books. 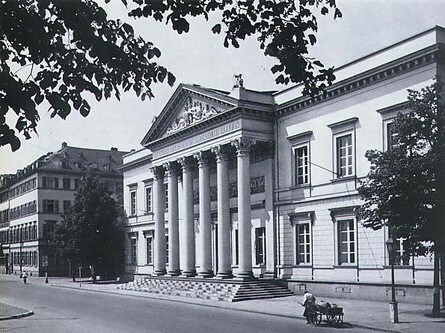 At the beginning of the 19th century, the "Alte Stadtbibliothek" was considered the showpiece of the Schöne Aussicht on the Main's north bank. By the end of the 19th century, it was the second largest city library within the German Empire, with several extensions and over 170,000 volumes. After the National Socialists seized power, the library's fate seemed predestined. 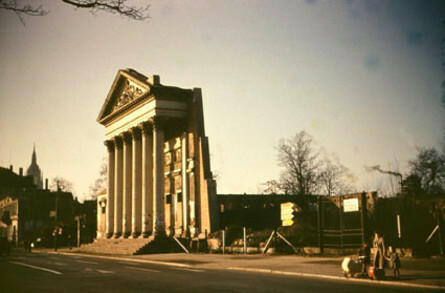 During a major airstrike in December of 1943, the building was severely damaged. Further assaults in January and March of 1944 destroyed it almost completely. The portico was the only part of the building that remained intact. ... it was discussed to build a memorial to the victims of World War II. The ruins of the Old City Library played a vital part in this discussion that lasted until 1968. In the end, no memorial was erected. The portico was merely structurally secured. 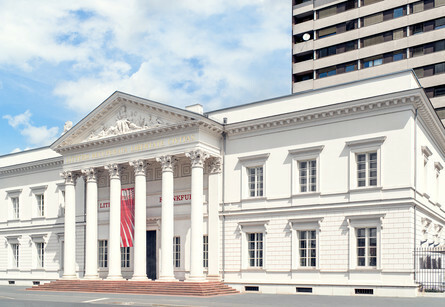 Over 40 years later, the temporary exhibition hall of the Städelschule was put up right behind the front columns. This new construction and extension consisted of a closed cube made out of trapezoidal sheet metal. It was a radical antithesis to the portico's elegance and was commonly referred to as "Container". The name "Portikus" became synonymous with the exceptional exhibition space for contemporary art from the art school Städelschule. In the 1990s, the Portikus-area was again the subject of discussion. This time, it was debated whether to pursue a historical reconstruction or rather a modern reinterpretation of the Old City Library – this debate is known as "Frankfurter Säulenstreit“. In the end, it was settled upon a historical reconstruction. In 2001, the charitable Hertie-foundation secured funding with an exceptionally generous contribution – in addition to donations by citizens and institutions of Frankfurt as well as funds from the regional state bank of Hesse-Thuringia. By then it had been decided: the Literaturhaus Frankfurt am Main e.V. would be the future user of the new building. 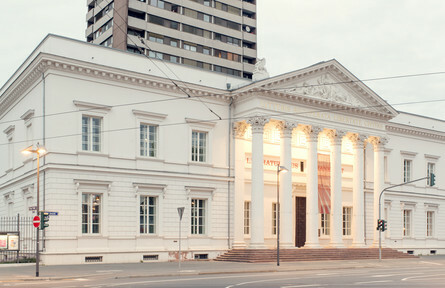 In October 2005, the building, which had been planned by Prof. Christoph Mäckler, was completed and the Literaturhaus Frankfurt moved into the reconstructed Alte Stadtbibliothek. On October 8th, 2005, the literary opening was celebrated with a reading by author Péter Esterházy at the Schöne Aussicht. ... you, too, could hold a meeting or throw a party. Institutions, companies and private persons can rent facilities for events, festivities, congresses, seminars, press conferences, receptions and dinners. Please contact Julia Ketterer at kettererliteraturhaus-frankfurtde, 069 – 75 61 84 10. We are looking forward to meeting you at Literaturhaus Frankfurt!